Science Council of Japan (SCJ) and the Japan Federation of Engineering Societies (JFES) served as host of the Committee on Disaster Risk Management (CDRM), for an eight-year term from 2009 to 2017. The CDRM was formally transferred from Japan to Peru during the WFEO General Assembly, in December 2017. The Peruvian Engineers Association (CIP) will serve a host of the CDRM from 2018 to 2021. CDRM activities begin by understanding that disasters have caused more than seven trillion US dollars in economic damage and eight million deaths since the start of the 20th century. Earthquakes, storms, volcanic eruptions, landslides and floods of diverse origin have struck humankind and its development infrastructure. Disasters will continue to negatively impact different regions of the world, mainly the most vulnerable, as a result of a greater concentration of people in areas more exposed to natural hazards and climate change. In addition to the protection of populations and modern infrastructure, it is also necessary to consider the protection of cultural and natural heritage, since its loss is irreversible. Proper preparation, response and recovery are and will be required in order to cope with and survive large-scale disasters. Within this framework, engineering appears as a key set of disciplines using updated scientific knowledge to address the risk in the event that such natural phenomena could become disasters. Thus, engineering, planning and implementation of standards to minimize vulnerability contribute to reducing disaster losses. 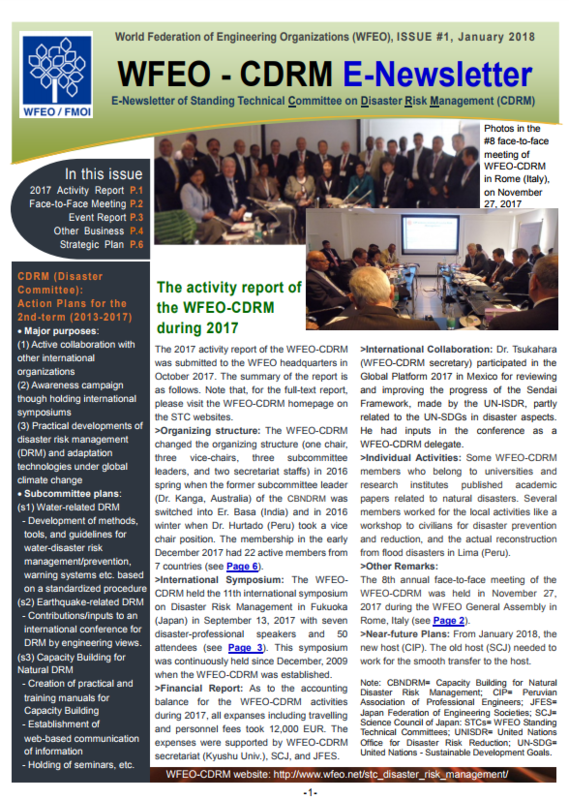 The WFEO Committee on Disaster Risk Management (hereafter the CDRM) is a motivated team of engineers that work voluntarily for the development and strengthening of a worldwide network of scientists and engineers, who deal with hazardous natural phenomena, in order to reinforce the various processes of Disaster Risk Management and create safer, resilient and sustainable societies. CDRM activities are developed to support the implementation of the global disaster risk reduction initiative, the Sendai Framework for Disaster Risk Reduction 2015-2030 through engineering. Likewise, the CDRM will direct efforts to contribute to the Sustainable Development Goals (SDGs). The CDRM should contribute to all parts of the risk cycle, including identification, evaluation, mitigation, and the adaptation to disasters, which relate to all aspects of human life as well as to the economy, social activities, and the environment. As a standing committee of WFEO, the CDRM aims to promote the culture of disaster risk management through the dissemination of applicable knowledge and best engineering practices. It also promotes research and exchange of experiences in DRM at local, regional and global levels, in order to reduce disaster risks. The CDRM will gather and disseminate DRM-related information that can help WFEO member countries, engineering societies, and leading engineers effectively mitigate risk and help societies adapt adequately to potential risks. The CDRM also helps to build the capacity building of engineers working in these areas, by disseminating information through WFEO member country linkages to decision makers, governmental organizations, engineering societies, and leading engineers. The CDRM also coordinates international DRM efforts, and organizes conferences, presentations, and workshops related to DRM. The CDRM shall support the WFEO and the engineering profession worldwide by encouraging countries to implement the Sendai Framework for Disaster Risk Reduction, whose objective is to significantly reduce deaths, destruction and displacement caused by disasters by the year 2030. This committee wants to maintain the CDRM policies of the former headquarters of Japan to achieve disaster risk reduction, through continued engineering engagement to create safer, sustainable and resilient societies. The current mandate wants to promote the implementation of National Committees on Disaster Risk Management, for which purpose it will call the WFEO National Members to consider forming an international network of specialists that have an active position in the face of the occurrence of disasters in impacted areas. Encouraging and supporting CDRM team leaders to organize international webinars, technical-scientific events and publications related to their work within the strategic plan, with the aim of developing and promoting DRM policies, strategies and practices to reduce disasters caused by natural phenomena. That way the CDRM wants to strengthen its visibility and presence in the public sector, academic institutions, and multilateral organizations. The CDRM operates as a knowledge-hub that focuses on recognizing and promoting the worldwide contributions of engineers and practitioners, and on providing need-driven education and information to engineering communities around the world, especially in developing countries. The scientific analysis and advice on reducing risk (a combination of hazards and vulnerability) provided and distributed by the CDRM, provides an opportunity to improve societies and ways of living. In particular, understanding the scientific basis of a particular risk creates a crucial opportunity to make sustainable societal adjustments instead of unsustainable ones. Reducing disaster risk reduces damage that might otherwise impede continued economic development and environmental sustainability. Sharing best practice and lessons learned, as well as DRM networking and information sharing, are two important operating principles of the CDRM. Natural disasters are categorized as either water-related disasters or earthquake-related disasters for further investigation and discussion in the CDRM.